Square Enix and Eidos Montreal announced that Deus Ex. Mankind Divided will hit stores worldwide on February 23 next year. 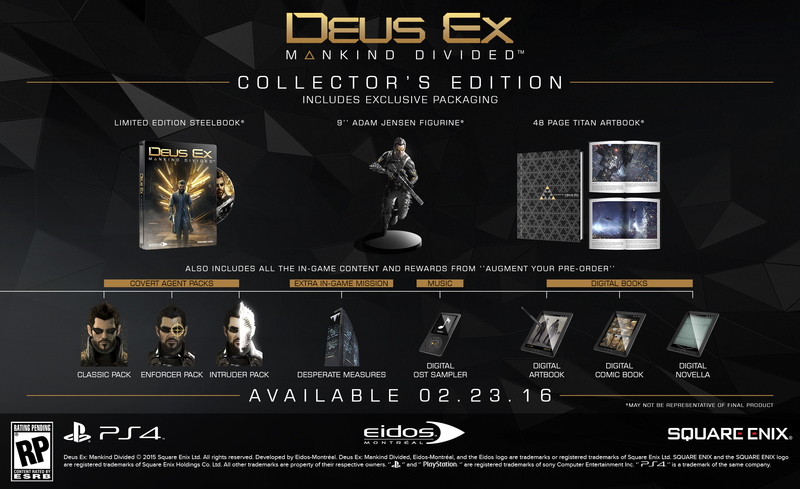 The Collector’s Edition of the game includes all content from all tiers mentioned above, plus a SteelBook, a 9″ Adam Jensen figurine, a 48-paged sample from the Titanbooks art book and of course, the game itself. A price for the Collector’s Edition wasn’t mentioned yet. The game will release on PC, Xbox One and PS4. Posted in Deus Ex, PAX Prime 15.